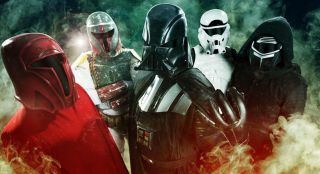 Guitarist Covers 'Star Wars' "Imperial March"
Watch Galactic Empire Play "Rehearsal One: A Galactic Empire Story"
One of the best things about a new Star Wars movie is that it usually means a new video by a mysterious band called Galactic Empire. In this 2-year-old video, Cooper Carter plays all 31 orchestral parts heard in the original big-screen version of the Star Wars theme song—on guitar. Peavey Electronics has released a line of licensed guitars and accessories adorned with graphics based on Star Wars. The products will be unveiled at this year’s San Diego Comic-Con International. Did Han Solo play guitar solos? We may never know. What we do know is that 22-year-old Brian Fisk of Missouri has made his very own Millennium Falcon guitar.